Sometimes, your saddle squeaks. Most new saddles squeak, and it can take a lot of rides before the squeaking quiets down. While some folks don't mind the squeak, and others even enjoy the sound (it can be sort of pleasant to hear the squeak of your new saddle on that first ride) at some point it usually becomes annoying. 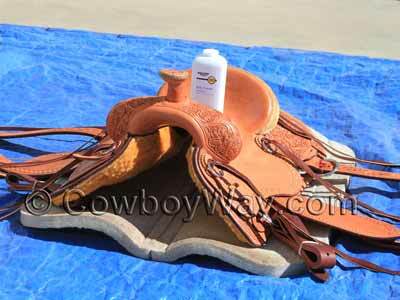 If you are ready to get rid of the squeak in your saddle, the baby powder treatment described below should do the trick. You will need your saddle, a container of baby powder, a firm surface, and some sort of blanket or pad big enough for your saddle to fit on. In the photo below we put a blue tarp over a concrete slab with a thick saddle pad on top. Turn your saddle upside down. 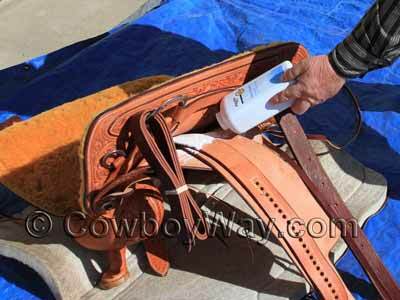 Since most saddle squeaks come from the friction of leather rubbing on leather, you're going to pour baby powder into all the leather-on-leather areas underneath your saddle that you can find. This will reduce the friction and eliminate the squeaks. Pour baby powder into every nook and crevice you can find (between the skirt and stirrup fender, between the stirrup fender and the seat jockey, etc.). If you can pry it open with your hand or fingers, pour baby powder into it. Be generous, and pour it from one end of the saddle to the other. Don't forget to do both sides. 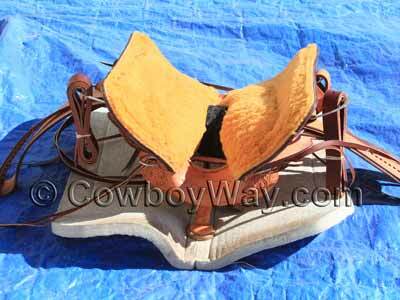 You will want to make sure the baby powder settles as deeply into the saddle as you can get it. Probably the easiest way to do this is to pick the saddle up and thump it back down again, several times. You don't want to scratch or scuff your saddle, which is why you're doing this on a blanket or pad. 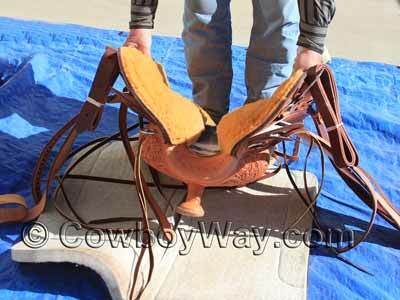 The saddle in the photo is a heavy ranch saddle so it is being lifted and thumped back down first by the front end, then by the back end. One treatment may do it, but if necessary you can repeat the steps (more baby powder, more thumping), then you're ready to ride your quiet saddle.